It is modern home with an open concept design, a large kitchen with an unbelievable amount of counter and cabinet space, an abundance of windows to let the gorgeous sunshine in and six spacious bedrooms. This sounds like a fairly standard home, well maybe except for the six bedrooms! And, for the most part, it is. What makes it unique is the people who live there and its purpose. 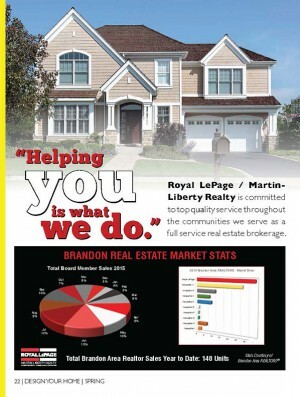 The 2884 square foot home located at 1323-8th Street is owned by Gail Freeman-Campbell, owner of Daughter on Call, a private home care business in Brandon that started in 2012. Gail built the home to meet the needs of her home care clients, as well as others, who are requiring the next stage of care, which generally means 24-hour care that is no longer in their own homes. If it wasn’t for the support of Sunrise Credit Union, this project would not have been possible for Gail. “We do provide 24-hour care in a person’s own home, however this is not always affordable to everyone which leaves them with the only other option – moving into a personal care home (PCH) that may take many months before a room is made available to them. And the room in the PCH will usually involve sharing the space with 1-3 other individuals which is a difficult transition for most people, “ said Gail. After recognizing the need, Gail started to research what options were available. She discovered similar housing units in Saskatchewan that she felt would also work in Manitoba. The homes in Regina weren’t new and were converted from existing homes, but the overall concept was what she was looking for. The residence, which is currently full, can accommodate six to ten people, including couples. Those living in the home have their own private bedroom with individual on-suite bathrooms. And, it truly has all the comforts of home as two hypoallergenic friendly, adorable furballs named Cali and Ellie-May also take up residence with their human friends. “We provide everything that they could possibly need or want while they are with us. We look after all their personal care needs, their medications, we prepare and serve meals, assist with eating if necessary and cater to specific, individual needs as required,” said Gail. The home was built by Westman Premier Homes with careful planning of the design and layout to fully accommodate a variety of clients. All the rooms throughout the house are spacious, the hallways are wide and every room is accessible by wheelchairs or walkers. In addition, a durable, commercial-grade vinyl plank flooring was used throughout the home. It was chosen for durability and easy maintenance. To make the home healthier and to save money on energy costs, Insulated Composite Envelope Panels (ICE-panels) provided by Greenstone Structural Solutions were used for the foundation and the exterior walls. The combination of a double framed wall using steel and EPS insulation provide a superior performing building shell with no toxic off-gassing or VOC content. “It was a unique project, we really haven’t built anything like it before and it was the first time that we used the Greenstone ICE-panels. 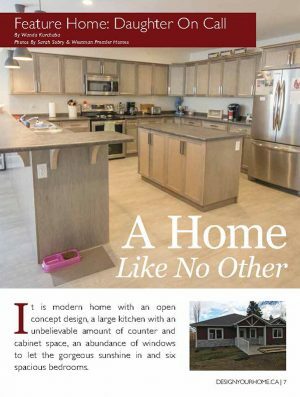 From start to finish the project came together well and went very smoothly,” said Scott Bromley, Manager of Residential for Westman Premier Homes. As the kitchen is generally the hub of any home, good working space with proper form and function was essential for this new build as well. NuTrend Kitchens worked with the team to create a space to meet the needs of the caring staff, who pride themselves in preparing delicious home-cooked meals, desserts and treats. If residents wish, they can also help prepare meals, do some baking or assist with clean up so the spacious kitchen design works well when there are lots of helping hands. “We also wanted to have a lot of natural light and good lighting, so having a lot of windows was an important part of the design. Budget Blinds worked with us to choose window coverings that would maximize the amount of light coming in, while still providing privacy. We chose a neutral colour palette to reflect light and make the home bright and cheerful. We painted the doors and trim a contrasting colour to make them stand out for those who have a difficult time seeing,” said Gail. The project was finished last fall and residents started moving into their new home in November. Some came from their own homes, as they were no longer able to live on their own and others moved from personal care homes. After a few months, Gail couldn’t be more pleased with the model and level of care that they are able to provide. “We try to promote as much independence as we can, which looks different for every person. There’s lots of interaction here and residents are encouraged to make choices for themselves. They decide when they want to go to bed or get up in the morning. Everybody needs a purpose and we want to try to empower them and allow them to still have control of their own lives and situations,” said Gail. 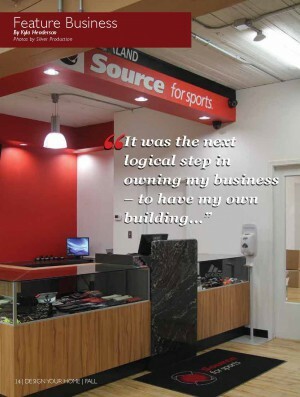 Westman Business, a division of Westman Communications, worked with Gail to make sure this location was set up with the most up to date communication systems including WiFi and TiVo. They wanted their residence to experience all the comforts of home while living here. While the concept of the house was originally researched and built based on seniors, Gail quickly realized that there is also a need for clients who require 24-hour care that are not elderly. 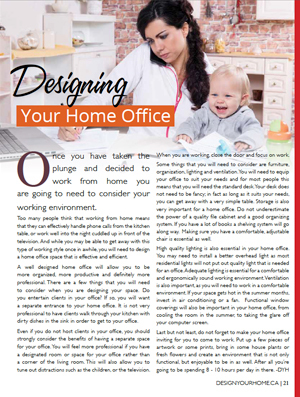 Those of a younger demographic who may have multiple sclerosis, brain injuries or have been diagnosed with young-onset dementia benefit also from this style of shared living space. “I feel like we’ve made a difference with not only the people that live here but their families too. We provide a real sense of peace of mind. Family members can now take a step back from being the caregiver and go back to being that family member again. They can come and go and visit and enjoy their time together versus worrying about doctor appointments, physical care or whether their loved ones are eating well and getting proper nutrition,” said Gail. After seeing the results of the positive environment that they’ve created for the residents, Gail is currently looking for more opportunities to build a similar type of home in Brandon as well as in other communities throughout Manitoba. 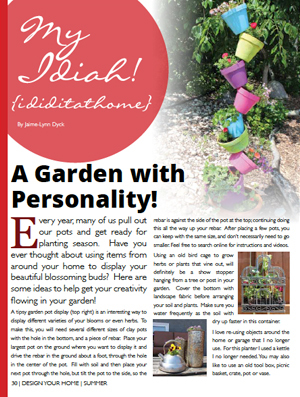 My Idiah: A Garden with Personality!